This beautiful floral print features a large pink rose watermark sketched with soft highlights and has smaller red roses scattered around in a white backdrop. Twin 4 Pieces Luxury Duvet Cover Set with Reversible Design. The oversized flat sheet provides versatility; it can be tucked under the mattress or can hang with no need for bed skirt. Concealed plastic snaps at the foot of the duvet cover make it easy to insert a comforter, quilt or blanket. 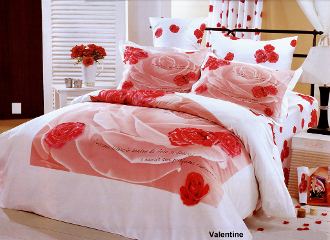 The complete bedding set comes in an elegant gift box covered with glossy paper and tied with an ornamental bow. The French Designer gift bag is also included in the bed in bag package.